The double church, dedicated to Our Lady and Saint Basil consists of a lower church that has maintained its Romanesque character and a neo-Gothic upper church, in which the relic of the Holy Blood is preserved. This chapel is located in a corner of the Burg square and judging by the richely decorated facade you would not immediately expect a chapel behind it. This flamboyant facade is actually a 16th century staircase that connects two underlying chapels: the Romanesque Saint-Basiliuschapel and the (neo)gothic Holy Bloodchapel. 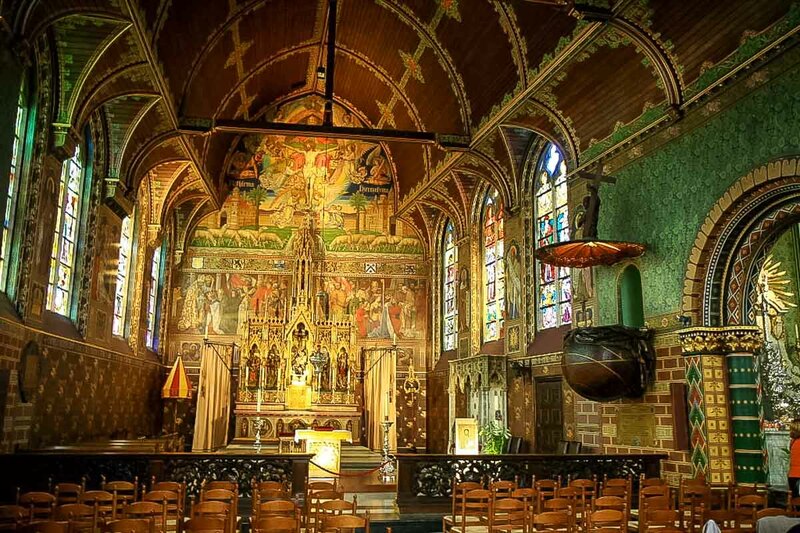 The Basilica of the Holy Blood is a Roman Catholic minor basilica in Bruges. 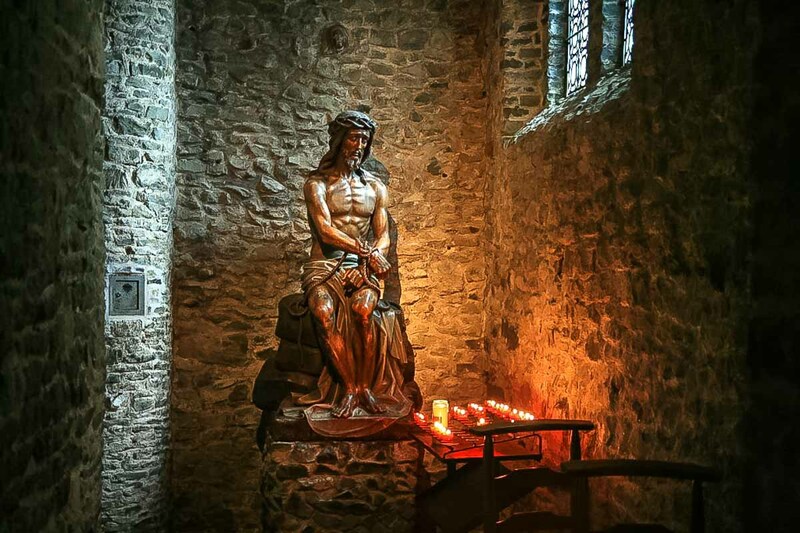 Originally built in the 12th century as the chapel of the residence of the Count of Flanders, the church houses a venerated relic of the Holy Blood allegedly collected by Joseph of Arimathea and brought from the Holy Land by Thierry of Alsace, Count of Flanders. Built between 1134 and 1157, it was promoted to minor basilica in 1923. The two levels could not be more different. Snugly located in a back corner of Burg Square, the Basilica of the Holy Blood consists of a Romanesque lower chapel and a Gothic upper chapel. The two levels could not be more different: the Romanesque lower level is austere with very little decoration, while the Gothic upper level is alive with color and detail. The two chapels are connected by a monumental brick staircase, which runs behind the grand facade facing the square. The stairs and facade were built in 1533 in the Renaissance style, but demolished during the French occupation. They were rebuilt in the 19th century. 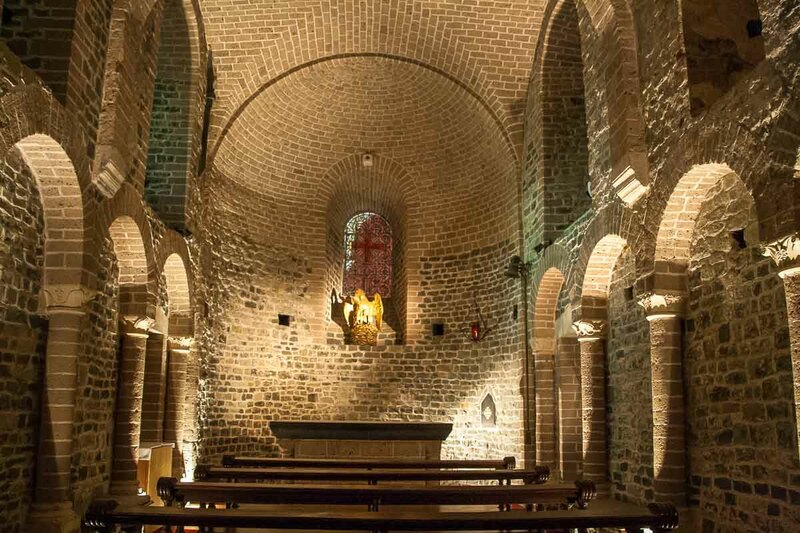 The lower chapel, the Chapel of St Basil, is the only Romanesque church in West Flanders. The lower chapel, the Chapel of St Basil, is the only Romanesque church in West Flanders, dating from the first half of the 12th century. It was built by Derrick, Count of Alsace (1128-1168) and dedicated to St Basil the Great to house a relic of the Greek theologian (d.379) brought back from Caesarea during the Crusades. The chapel has a short nave, tiny side aisles, a choir and apse. 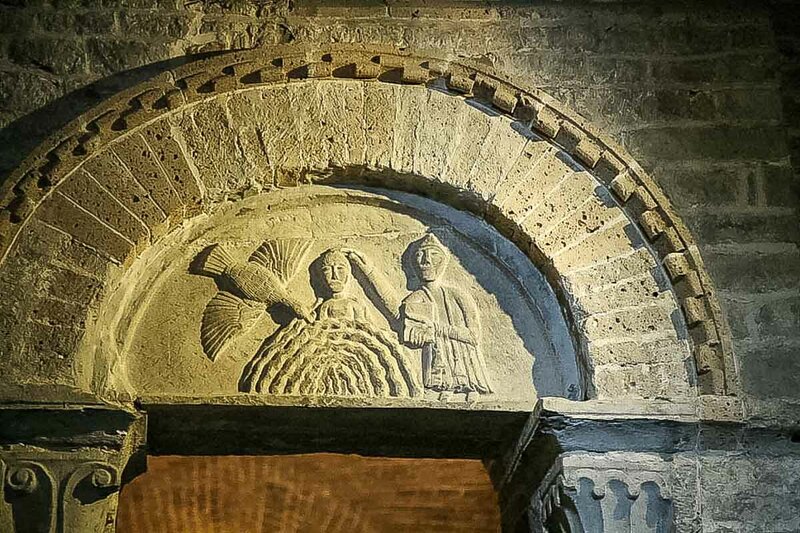 The doorway connecting the right aisle with the nave has a small sculpted tympanum (12th century) depicting the baptism of St. Basil. The right aisle also contains a polychrome statue (c.1306) of the Madonna and Child, displayed behind glass. The lower chapel dedicated to St. Basil the Great is a dark Romanesque structure that remains virtually unchanged. The venerated relic is in the upper chapel, which was rebuilt in the Gothic style during the 16th century and renovated multiple times during the 19th century in Gothic Revival style. The chapel of Saint Basil is one of the best preserved churches in Romanesque style. Built from 1134 to 1149, the chapel is dedicated to St. Basil the Great of whom a relic was brought back by Count Robert II from Caesarea Mazaca in Cappadocia, Asia Minor (modern-day Turkey). The chapel consists of two side naves and a central nave continued by the choir, which in turn is ended by a semi-circular apse. In the tympanum above the entrance linking the chapel and the annex is a 12th-century representation of the baptism of Saint Basil. In the right nave, the seated Madonna and Child (Sedes Sapientiae) is a wooden polychrome sculpture of the early 14th century. Carried each year during the procession, two venerated wooden statues, made around 1900 and representing Jesus on the Cold Stone and the Pieta are displayed. The upper chapel was originally Romanesque as well, but is now Gothic with mostly modern decoration. 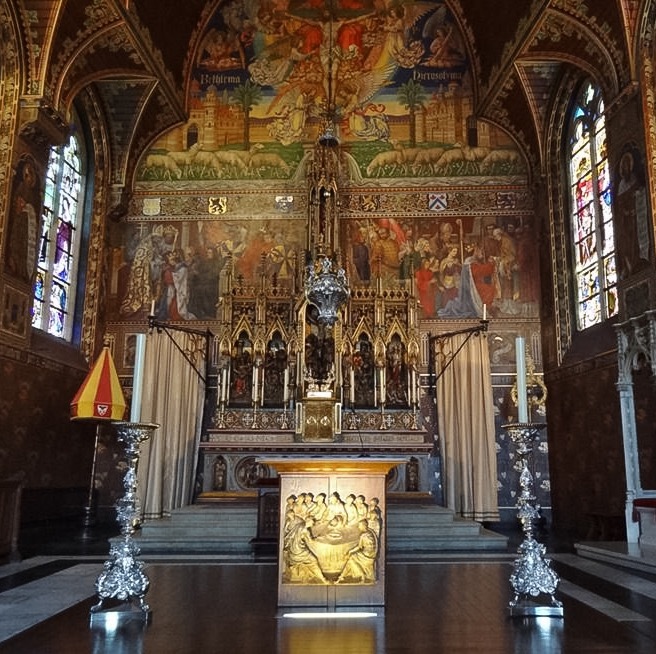 It is lit by stained glass windows and covered with murals, including a brightly painted altar backdrop depicting the Trinity and scenes relating to the Holy Blood relic.The Holy Blood relic is embedded in a rock-crystal vial, which is placed inside a small glass cylinder capped with a golden crown at each end. The relic is kept in a magnificent silver tabernacle with a sculpture of the Lamb of God in the large side chapel of the upper church. More reliquaries can be seen in the Basilica Museum. The basilica is best known as the repository of a venerated phial said to contain a cloth with blood of Jesus Christ. Legend has it that after the Crucifixion, Joseph of Arimathea wiped blood from the body of Christ and preserved the cloth. The relic remained in the Holy Land until the Second Crusade, when the King of Jerusalem Baldwin III gave it to his brother-in-law, Count of Flanders Diederik van de Elzas. 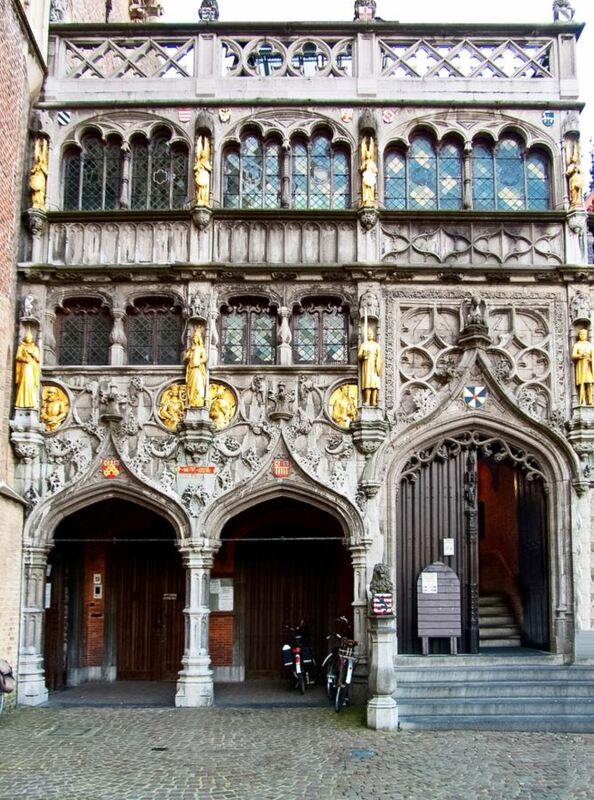 The count arrived with it in Bruges on April 7, 1150 and placed it in a chapel he had built on Burg Square. However, recent research found no evidences of the presence of the relic in Bruges before the 1250s. In all likelihood, the relic originated from the 1204 sack of Constantinople by the army of the Count of Flanders, Baldwin IX during the Fourth Crusade. Ever since, the phial has played no small part in the religious life of the city. Pope Clement V issued a papal bull in 1310 granting indulgences to pilgrims who visited the chapel to view the relic. 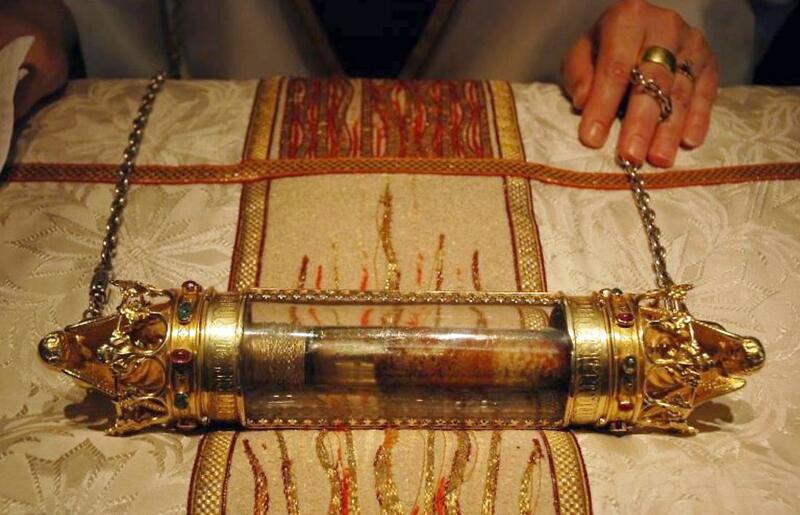 The relic is shown to the public every Friday and also every day from the 3rd to the 17th of May. Outside the chapel is the Holy Blood museum, which contains the shrine for the Holy Blood and other treasures belonging to the chapel. 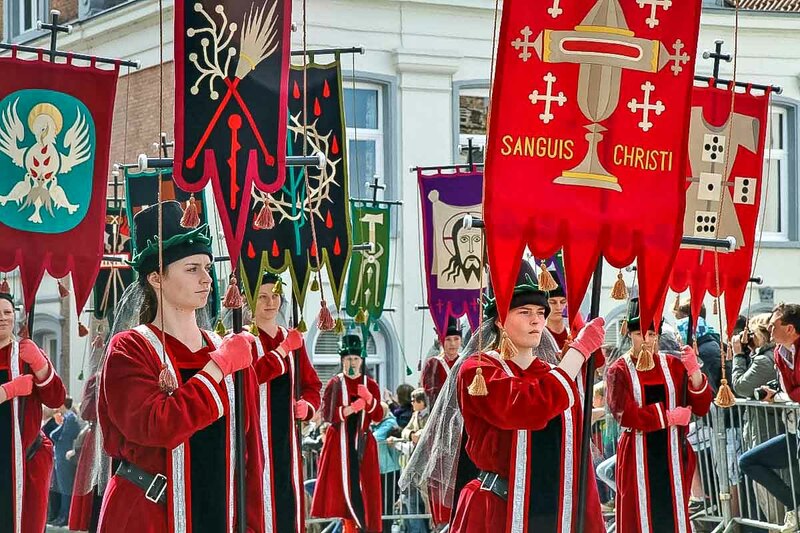 The colorful Procession of the Holy Blood is held on Ascension Day in the spring. 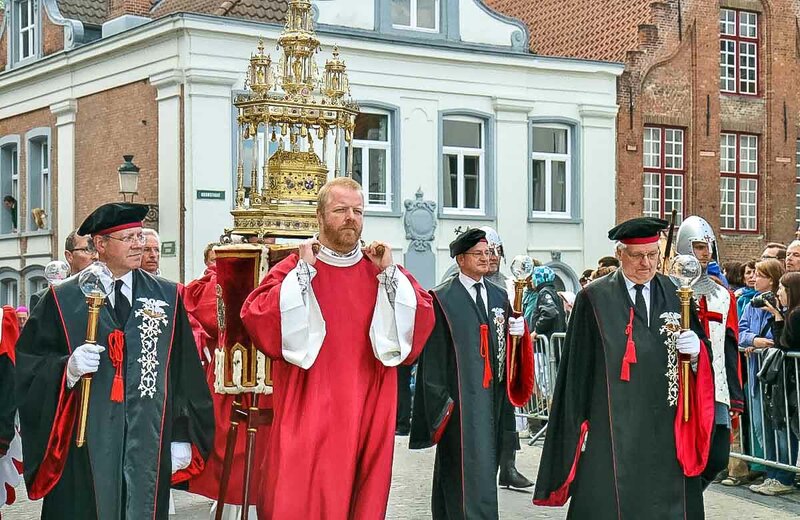 The bishop of Bruges carries the relic through the streets, accompanied by costumed residents acting out biblical scenes.The tradition of the procession is first recorded in 1291. It followed a route around the city walls until 1578, when the religious wars necessitated its relocation to the city center. It is this route that is still followed today.